Find out where healthcare providers will be spending to improve quality, standardize processes, and improve patient care. Which quality metrics are most frequently used as incentives? What’s the best way to assign quality responsibilities? 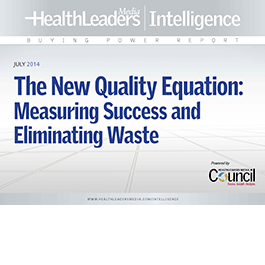 How is quality affected by EHR/clinical alignment? Find out where healthcare providers will be spending to improve quality, standardize processes, and improve patient care. Where will providers be spending to improve quality, standardize processes, and improve patient care? How did Scripps Health enhance its efforts to standardize clinical and operational functions across its hospitals and outpatient centers by adopting a horizontal leadership structure? Why is it important to extend the responsibility for clinical quality beyond the quality department? How did Virginia Hospital Center improve its HCAHPS physician scores from the 50th percentile to the upper 80th percentile in two years? How does the misalignment of the EHR with clinical workflow hinder improvements in clinical quality, care redesign, and collaborative care? How does Methodist Health System facilitate the sharing of best practices through an annual peer-driven quality summit for employees?